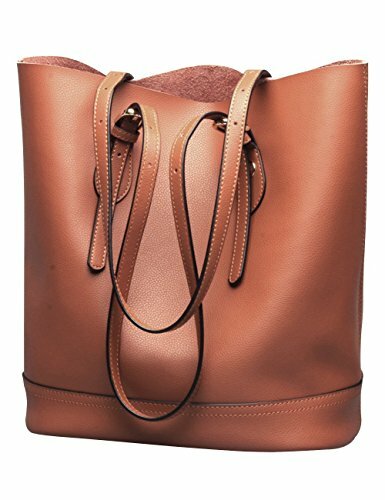 The design of the leather tote bag is noble and fashionable, especially highlight women's elegance. You can adjust the length of the handles at both sides out of the bag. The bottom of the bag is protected by four metal rivets from abrasion. The inner bag can be removed, so it will be convenient for you to clean the interior, which is very practical. Casual style in classic colors, the leather feels good. This bucket bag will never be out of style and it is suitable for any season. Top zipper closure for your security. Well designed and quality golden metal hardware is high resistance to rust, corrosion and tarnishing. Golden metal rivet protect on bottom. Simple designed, classic style and top quality, awesome gift for families and friends on Christmas, Thanksgiving Day, New Year, Birthday, Valentine's Day ,Mother's Day or any other special occasion. Material: Second layer of cowhide leather, the lining is made of high-class polyester. Lining: The lining is made of high-class polyester. And another feature of this bucket bag is that the inside bag can be removed when you unlock the buttons, which is convenient for washing. Large Capacity: Inner detachable pouch with large space:Open with a big compartment FIT A4 size items,a side zippered pockets for wallets and in the middle it has a large capacity zipper pocket,1 side slip pocket for keys/cards. You can almost carry all your stuff and they can be well organized! Gorgeous look and never out of style! Handles are durable with excellent bearing capacity, leather material, symmetrical?stitch and rivets reinforced handles guarantee the quality! The straps can be adjusted slightly at both sides.